Born in the German city of Hamburg, William Charles Thomas Dobson moved to England when he was nine and subsequently entered the Royal Academy Schools where he was able to further his education under the personal direction of Sir Charles Lock Eastlake. 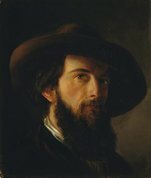 He was appointed headmaster of the Birmingham School of Design in 1843 but two years later departed for Italy to further his study of art. He later spent time in Germany where he came under the influence of the Nazarene painters. During the 1850s Dobson made a name for himself through the Royal Academy as an oil painter of edifying religious works before being made an academician in 1872. 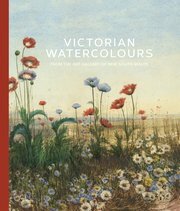 He was elected an associate of the Society of Painters in Water Colours in 1870 and a full member in 1875. A staunch defender of ‘pure’ watercolour painting, Dobson eschewed any use of bodycolour and developed a painstaking technique involving small touches of transparent wash applied in layer upon thin layer of gemlike colour. Artistic images idealising childhood – especially girlhood – innocence were produced in exceedingly large numbers over the course of the Victorian period. A prevalent theme was that of the rural child, who was often viewed as an exemplar of uncorrupted virtue and natural simplicity. Dobson’s absorbing character study epitomises the qualities of sweetness, sentimentality and meticulous craftsmanship that so allured the Victorians. Painted in 1877 and exhibited the same year at the Royal Academy before being shown at the Paris Exposition Universelle in 1878, the watercolour appears to have attracted little in the way of contemporary criticism.